One of the ways we can seek to improve Canada’s health system is by comparing the strategies, procedures, and success or failures, of countries with similar health systems to our own. With the recent launch of the North American Observatory on Health Systems and Policies (NAO) and its presence within IHPME, alumnus and adjunct faculty member Leslie Boehm felt this was the perfect time to create a comparative health system award that would support students in their research, and advance the study of comparative health policy. 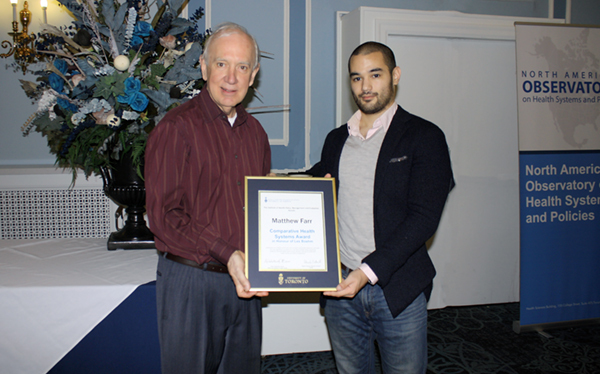 Third year PhD student Matthew Farr is IHPME’s inaugural winner of the Comparative Health System Award in honour of Les Boehm. The award recognizes a student who has provided outstanding leadership and has made a significant contribution to the field of health policy and evidence informed decision-making. Co-supervised by Women’s College Hospital’s Dr. Danielle Martin and by NAO co-founder and director Gregory Marchildon, Farr’s dissertation looks to examine the low rates of polypharmacy among seniors in Scotland, in comparison to the alarmingly high rate among their Canadian counterparts. Polypharmacy is defined as the use of five or more medications in seniors age 65 or over. As of 2016, the Canadian Institute for Health Information (CIHI) released data that showed 65.7% of Canadian seniors were navigating the use of multiple medications in their daily regimen with many inappropriately prescribed. The significant number of seniors in this situation can put cost pressure on the health system and also lead to negative health outcomes. “The number of drugs you take increases the number of negative drug interactions you may be exposed to, which in turn might increase the number of falls, or hospital admissions among the older population,” said Farr. After looking at data from several OECD countries, Farr found that Scotland showed one of the lowest rates for polypharmacy with only 28.6% of seniors having five or more medications in their regimen, and the distinction between appropriately and inappropriately prescribed medications also markedly different. From national initiatives involving prescribing monitoring appointments to physician adherence to a generic formulary and robust consultation process, Scotland appears to have implemented a successful approach. While researching the system Scotland has in place, Farr is looking to see where the gaps are in Canada’s prescribing process. “There is a lot we still don’t know, and there are multiple contributing factors, such as the level of collaboration between physicians in Canada when it comes to being aware of a patient’s multiple prescriptions, or whether Scotland has more geriatricians and a less diverse population than we do,” said Farr. As he continues his research, Farr will investigate what Canada might do in terms of next steps, drawing on lessons from Scotland’s case and determining the value of what they have achieved both in terms of costs to the health system and the quality of life of their citizens.